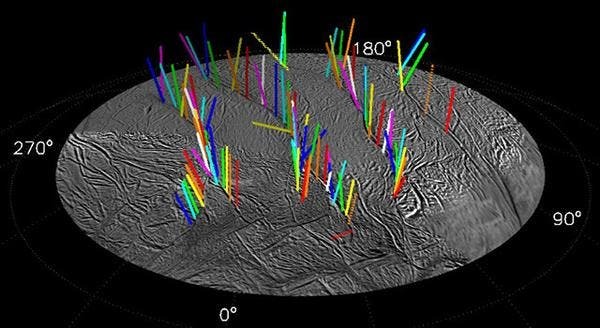 The geysers on the surface of Saturn’s moon Enceladus have been counted and mapped, strengthening theories that Enceladus is one of the best extraterrestrial places in our solar system to look for life. Earth is not the only place in our solar system which holds water. For example, Enceladus also has liquid oceans – albeit ones covered by a thick layer of ice. Researchers believe that the oceans are kept liquid by heat generated by the gravitational stress which Saturn holds on its satellite. The tectonics of Enceladus is also surprisingly active, and one of the results are the 101 geysers on its surface. Scientists are fairly sure that the gravitational pull keeps the ice melted and created these hot spots – but the exact mechanism through which the geysers form is still not clear; one theory is that huge chunks of ice act somewhat similar to tectonic plates, and the friction between their edges generates heat close to the surface. Another theory is that water boiling deeper flows to the surface, creating the surfaces we see today. If you look at the map of the geysers on Enceladus, again, you see a similarity to Earth tectonics – the geysers are concentrate on distinct lines, like volcanoes are concentrated at the edge of tectonic plates here on Earth. In this case, the lines coincide with the areas of most stress. Still, regardless of the formation mechanism, Enceladus seems like a very interesting place to look for alien life – something which you wouldn’t initially expect, for the satellite of a frozen gas giant like Saturn.